I have 74 tasks on my computer with PROGRESS = 100% and STATUS = "Upload: pending (project backoff: 04:41:47)". Yesterday there were 42. A couple of days ago there were 31. These tasks appear to be accumulating without being sent back. Is this normal? If not, how can I fix the problem? It is not normal. Once in a while there is a problem with the servers which has this effect on many users, but I don't think one of those problems has been active in your period of non-success. 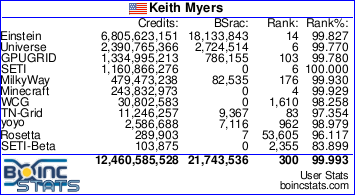 Have you reviewed the message log visible from Boinc Manager at Tools|Event log? There are ways to turn on much more detailed reporting for that log which I think you can find if you look around here on the forums. Or perhaps someone will chip in something more useful. Resort to the BOINC Manager Event Log diagnostics option from the menu. Under <Options> <Event Log Options> Tick <http_debug>; <network_status_debug>; <http_transfer_debug> and maybe <checkpoint_debug> and report back the log entries.